Performance, by its very nature, serves both as an answer to this question and a challenge to it. By our witnessing as audience members, we hear ‘the tree’ and, in doing so, assign meaning to experience. But what about performances of the past? How do they live on? For actors in live theatre, only through an audiences’ sometimes-conflicting memories (and in some cases, recordings or reviews) are their performances memorialized. A performance becomes a symbol, a sensory memory, a concise sentence, or a legend. It’s this idea that fuels performance artist Dickie Beau’s latest piece, Re-Member Me, which is largely centered on remembrances of the late British actor Ian Charleson’s performance as Hamlet in Shakespeare’s play, a role he took on (replacing Oscar-winner Daniel Day-Lewis) at London’s National Theatre less than three months before his death from AIDS on January 6, 1990. Beau, who fits somewhat untidily into the category of ‘drag performer,’ uses lip-synch as his primary mode of expression. For this particular piece, he uses interviews, particularly with four theatre professionals who remember Charleson’s performance, as the centerpiece of his work. The four primary voices are those of actor Sir Ian McKellen, John Wood (formerly Beau’s theatrical agent), Sir Richard Eyre (artistic director at the National Theatre at the time of Charleson’s performance), and director Sean Mathias, who directed Charleson in a benefit reading of Martin Sherman’s play Bent in 1989. Beau lip-synchs each of these men’s scattershot recollections, his head projected four times horizontally across a screen, his lips animating as each subsequent voice begins or ends its testimony. Other voices enter into the conversation, but these central four are the most affecting, comprising, collectively, a portrait of a performance of the past, remembering not only the late actor’s triumph in the role but his physical prowess onstage despite his progressing illness and the poignancy of his proximity to death in a play so deeply etched with Shakespeare’s own sentiments on the subject. All this is not to say that Re-Member me is a morose portrait of grief. 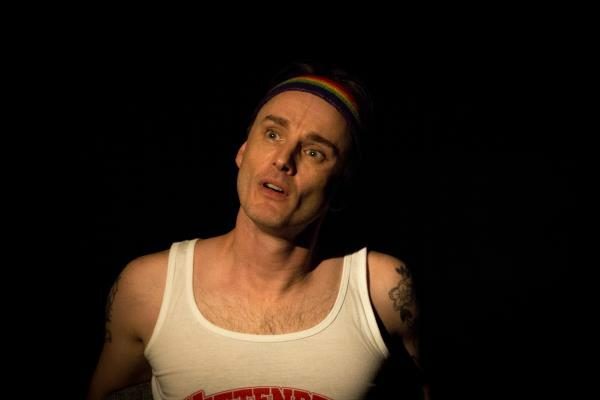 It’s a celebration of a vividly-remembered theatrical performance and an often-funny exploration of Beau’s own attitudes toward performance (the show also includes a Village People-inspired Hamlet mash-up lip-synch for good measure. Beau also uses an assortment of mannequin parts strewn across the stage as a means to play with various concepts, not just of the corporeal, but of life as performance, of costumes and clothing as a manifestation of our inner lives, and of the role of theatre in the lives of those who worship at its altar. It’s a piece that, by its nature, demands to be seen rather than described. A review can only scratch at the surface of a performance. Through witnessing, we do our best as human beings to grasp in the dark for some way to describe, to keep, to record. It’s possible that in doing so we fail, but in continuing to try we retain our humanity. Re-Member Me is, at its core, about that drive. Re-Member Me runs to January 14 in Under the Radar. More production info can be found here.